Are you sure we have to go to Mars..? Human imagination can create both incredible and terrifying things. And the latest creation by Japanese builder Moko perfectly illustrates this thesis. This absolutely bizarre creature from Mars is odd in so many ways. Not only does its overall design gives me shivers, but also the choice of pieces and their combinations are simply outlandish. Can you guess what piece is used for the martian’s snout? If Arsia Prime looks as good in real life as it does in the pictures, sign me up! Just like The Martian, everything about this off-world arboretum is fantastically realistic. The terrain is gorgeous, offering a stunning variety of layering, subtly blended colors, and unique rock formations. Builder Ryan Howerter describes this simply as “a relatively near-future colony on Mars.” With the daily advances of space travel, these words may not be too far from the truth. Just in time for Ridley Scott’s film The Martian, Ryan Howerter presents his beautiful model of MAVEN, the Mars Atmosphere and Volatile Evolution mission satellite. His model is a commission for the University of Colorado Boulder, for display at the CU Heritage Center. 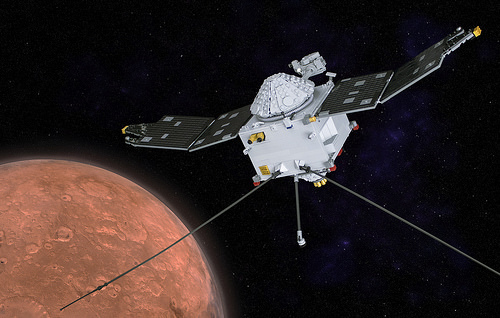 MAVEN recently celebrated its first year in orbit around Mars. This is the third model he’s built for the University of Colorado; MAVEN joins Voyager 2 and the Apollo 11 Service Module. Apparently, there are some Lego CUUSOO fans in the chalk art world. 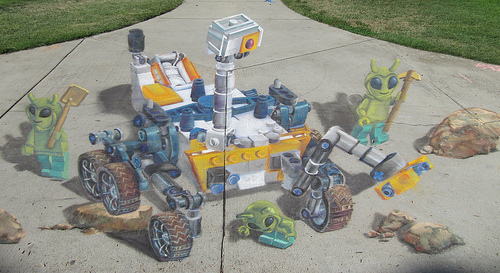 Check out this amazing rendition of the Curiosity Rover (recently announced to be an upcoming CUUSOO set) on the sidewalk. Thanks to Stephen Pakbaz for the heads up! Having immersed myself quite deeply in both the recent news from Mars and as a judge of the Real World Starfighter Contest, I felt compelled to do a bit of building to scratch that space itch. I’d already built Stephen Pakbaz’s Curiosity, so just had to build Sojourner (landed 1997) and Opportunity (landed 2004 and still operational) in approximately the same scale. There’s nothing functional about my LEGO Sojourner, but Opportunity has working rocker-bogie suspension (which I struggled mightily to build, since the design is different from Curiosity’s, and I couldn’t simply scale down Stephen’s LEGO version). I plan to build the lander at some point, too. After he landed on the moon with Neil Armstrong, astronaut Buzz Aldrin came up with an idea for a craft that would cycle back and forth between the Earth and Mars, providing significantly greater comfort for astronauts during the five-month journey. With the cancellation of the Constellation program, the dream of regular travel to and from the Moon and Mars seems even farther away. 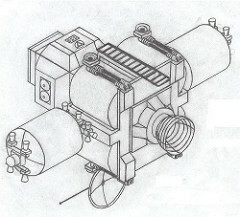 Nevertheless, I still find the idea inspiring, and built my own rendition of an “Aldrin Mars Cycler”. 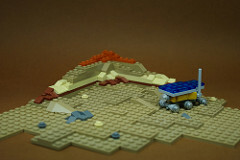 UPDATE (June 14, 2013): LEGO MSL Curiosity Rover is go for launch! 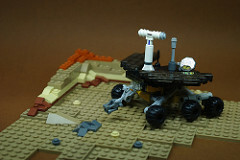 Back on August 5th when I first highlighted the excellent Mars Science Laboratory Curiosity Rover project by Stephen Pakbaz (Perijove) on LEGO CUUSOO, the project had been online for about eight months and had accumulated about 1,300 votes. In a sign that timing is everything (with a little help from a few friends on the web), Stephen’s Curiosity project hit 10,000 supporters this weekend. In fact, the project gained its final 5,000 supporters in less than 24 hours. I used Stephen’s instructions to build the rover myself yesterday, and it’s a really excellent model. The build itself was very enjoyable, and I even learned a few SNOT techniques I hadn’t seen before. The final model includes so much detail and functionality it’s really fun to play with, in addition to being just shy of fully functional (with working “rocker bogie” suspension, stowable mast & arm, and little details like forward and rear haz-cams). 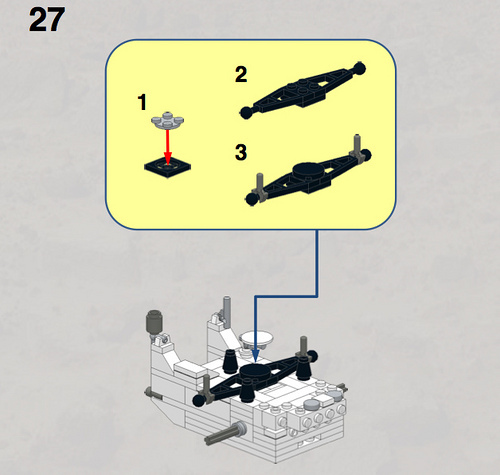 However, Stephen’s rover does include a handful of unusual parts, and parts in quantities or colors that I don’t have (especially the Technic parts for a mainly SYSTEM builder like me). Even with my substantial, relatively well-sorted collection, it took me the better part of an afternoon to dig around and gather all the parts, and I still had to place a couple small Bricklink orders to replace parts I don’t have at all in the right colors. All of this is to say that an official set will be a great way to easily get all of the necessary building materials for a reasonable price — as I’m sure LEGO won’t be charging $2 for the white bracket (of which the model requires two), for example. Congratulations to Stephen, and I can’t wait to see how LEGO handles this particular project. 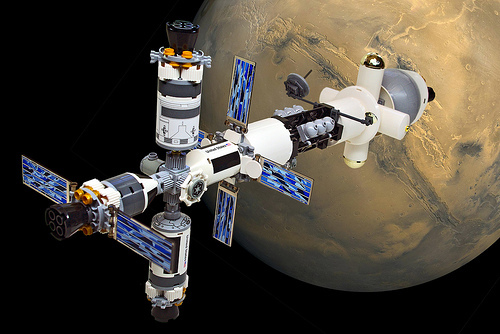 Specifically, I’d love to see LEGO accelerate the approval of this project, given LEGO’s existing partnership with NASA, the clear educational value of the model, and the current “space fever” gripping the world. 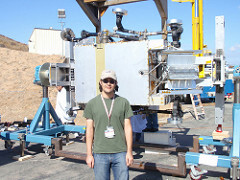 Finally, in case you missed it last week, be sure to check out our interview with Stephen Pakbaz (who worked at JPL as an engineer on the Curiosity project) right here on TBB. We’re generally not as quick to blog Technic and MINDSTORMS models here, so with apologies to our readers who’ve already seen this (but in the interest of completeness): Will Gorman and Doug Moran recently built a fairly functional version of the Mars Curiosity Rover, with four of six working wheels, robotic arm, and mast. 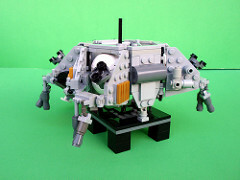 The LEGO Group provided all the LEGO, and the rover was featured at LEGO and NASA’s Build the Future in Space event at Kennedy Space Center. 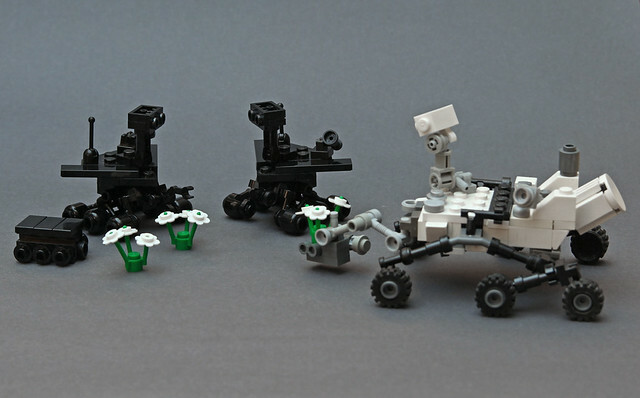 UPDATE (June 14, 2013): Stephen’s LEGO Curiosity Rover will be the next LEGO CUUSOO set! 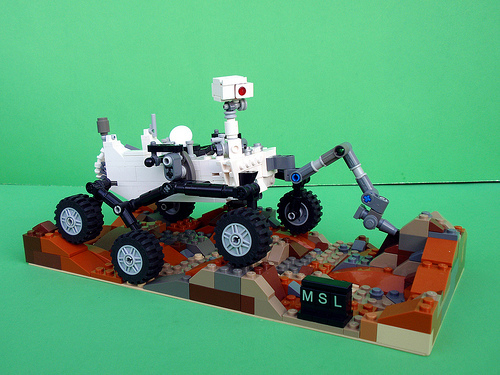 The Brothers Brick has featured the Mars Rover Curiosity CUUSOO project before as one of the more original and stand out projects on LEGO CUUSOO right now. But here is a surprising factoid, the creator of this model, Stephen Pakbaz, aka Perijove, was an actual engineer for Jet Propulsion Laboratory (JPL) and worked on designing the very same Mars Rover in real life! The Brothers Brick decided to interview Stephen. TBB: Tell us about your background? Perijove: I received my Bachelors Degree at the Rose-Hulman Institute of Technology in Terre Haute, Indiana, majoring in Mechanical Engineering with a concentration in Aerospace and a minor in Electrical Engineering, and then a Masters Degree in Mechanical and Aerospace Engineering at UC San Diego in California. TBB: What was your position at Jet Propulsion Laboratory? Perijove: My position at the Jet Propulsion Laboratory was a Mechanical Engineer in the Structures and Configurations Group. I also sometimes took on the responsibilities of a Cognizant Engineer. TBB: Can you tell us about your work on the Curiosity Rover? Perijove: The Curiosity rover was the first spacecraft I ever worked on after I finished with school in 2007. Even back then, the rover development was well underway, but there was still a lot of design, assembly, and testing left to do. I took part in all of these activities. I designed parts like brackets and covers and was responsible for their development all the way through delivering them to the technicians that would put them on the rover. Other tasks included writing procedures, assembling, and testing things like telecommunications systems and antennas. Types of testing included vibration, shock, and thermal-vacuum to simulate the different environments that would be experienced by the rover. One particularly fun test was bolting an engineering model of Curiosity to a 50 foot diameter centrifuge and spinning it up to over 20 g’s in order to simulate the forces the rover would experience during entry into the Martian atmosphere. 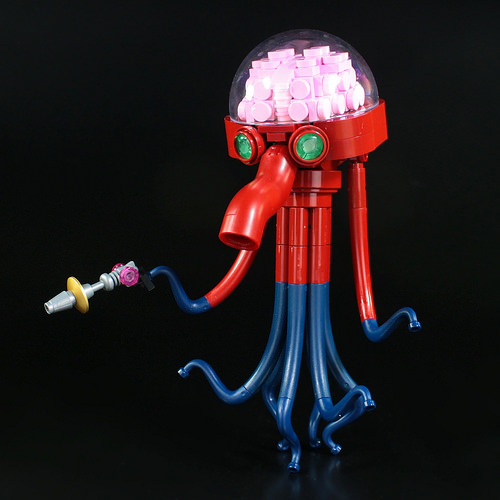 TBB: How long have you been a Lego enthusiast? Perijove: I have been a LEGO enthusiast since at least elementary school. My own collection, at the time, was mostly pieces like simple bricks and wheels, but I would often play with friends and their collections too. 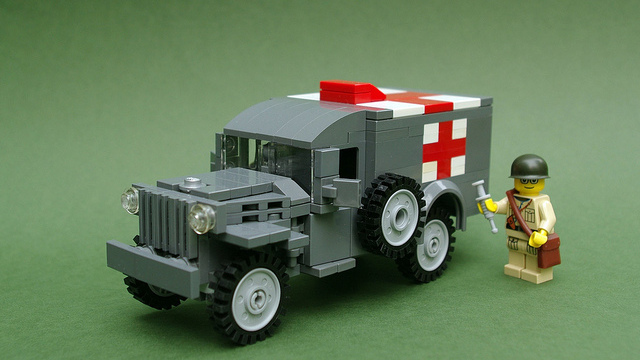 TBB: What experience did you have with Lego as a kid? TBB: Did LEGO play a role in your chosen career path? Perijove: LEGO absolutely had an impact on my career path. In high school, I spent much of my free time designing things like manned missions to the moons of Jupiter in graph paper notebooks. I often drew the designs with LEGO pieces so I could eventually create real models. This was also a great way to learn everything I could about space travel from interesting destinations and past missions to new forms of propulsion and radiation protection. LEGO has also been a great tool for quickly making quick prototypes of various mechanisms and other ideas to see how they worked. TBB: What were your favorite sets/ themes as a child? Perijove: Most of the space themes, of course, were my favorite, like M-Tron, Ice-Planet 2002, Exploriens, Roboforce, etc. Technic and Trains were great too, but those kinds of sets were often too expensive for me. I would have to say one of my favorite sets was 6338 Shuttle Launch Pad. TBB: Did you ever experience a dark age? Perijove: I never experienced a total dark age, but more like a dim age, while I was at school in Indiana. I couldn’t bring my entire collection with me form California, but I did manage to keep a few choice models and pieces with me. During this time, I also satisfied my LEGO habit as a volunteer and mentor for kids in the First LEGO League, a popular nationwide LEGO robotics competition. I had a lot of fun teaching kids about the mechanical possibilities of LEGO and seeing their robots compete and cooperate with eachother. 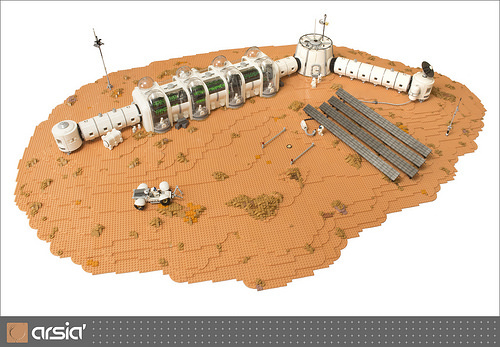 TBB: Did having first hand experience on the real Curiosity help with the design of the Lego version? Perijove: I learn best by seeing and touching, which perhaps explains my affinity for mechanical engineering and LEGO. 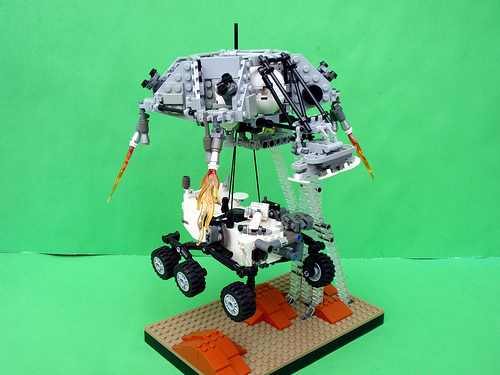 The rocker-bogie suspension system on the rover was just so cool, that I needed to make a LEGO version that I could play with. Being so close to the real rover all the time, designing a few small parts for it, and working with larger assemblies certainly helped me to understand its features, what they did, and how they worked. 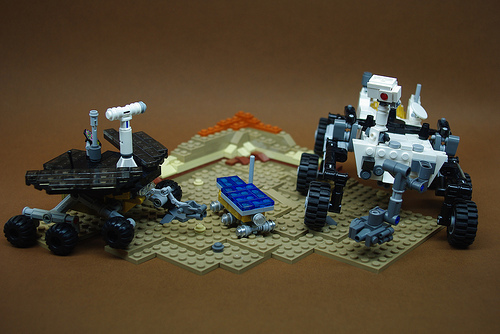 I’m hoping the LEGO Curiosity rover does the same for others. TBB: Did you follow the progress of the rover’s trip to Mars? Perijove: I kept up on every piece of information about the rover that was available to me. This was the first project where I was finally able to put my years of engineering education to use, so I really wanted it to be successful. I saw the landing live and ate plenty of peanuts beforehand for good luck, a tradition at JPL before critical mission events. TBB: How did you feel about the landing? Perijove: The landing itself was a conflicting conflagration of emotion. In my mind, I was confident of the success of the landing. My heart and other organs were filled with excitement, fear, nervousness, anticipation and, of course, curiosity. I knew I wouldn’t be able to sleep afterwards and spent that time calming down, talking to family and friends, and watching all the events that happened shortly afterwards. TBB: Any thoughts about the historical significance of this achievement? Perijove: The landing itself was quite historic. The ability to land such a large payload so precisely will be extremely important to future efforts. Though it’s still too early to be sure of the historical significance of the scientific returns of the mission, I’m sure it will be something wonderful. As for the significance of my own involvement, I think it’s kind of cool to think that long after the Great Pyramids on Earth have perished over time, it is possible that the rover I worked on will still be preserved on Mars (unless, of course, it becomes a victim of space looters). Mars Curiosity Rover roars through the Martian atmosphere ... and lands safely! As I post this, Curiosity has separated from its cruise stage, and JPL is receiving “heartbeat” transmissions from the spacecraft as it begins its entry into the Martian atmosphere. Good luck, Curiosity! UPDATE: Mars Curiosity Rover has successfully landed on Mars and is sending pictures. Congratulations!